The 10th seed thrashed Joao Sousa. 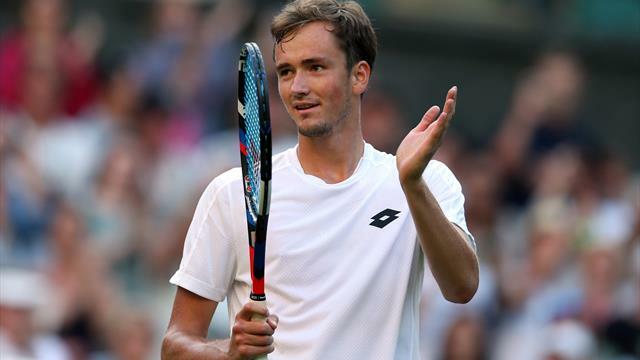 Daniil Medvedev advanced to the second round of the Rolex Monte-Carlo Masters following a comfortable straight-sets victory over Joao Sousa. The 10th seed thrashed his Portuguese opponent 6-1 6-1 in just 55 minutes to set up a clash with Radu Albot, who beat qualifier Aljaz Bedene 6-4 6-2. Marco Cecchinato, seeded 11th, progressed after Damir Dzumhur retired when 4-0 down in the first set, while fellow Italian Fabio Fognini was made to work hard for a comeback win over qualifier Andrey Rublev. The 13th seed fought back from losing the first set to seal a 4-6 7-5 6-4 triumph. David Goffin, who is seeded 16th, saw off Guido Andreozzi 6-1 6-4 but 12th seed Nikoloz Basilashvili was beaten 7-5 3-6 6-1 by Marton Fucsovics. Basilashvili was not the only seed to fall as 15th seed Denis Shapovalov was knocked out by Jan-Lennard Struff 5-7 6-3 6-1 and Great Britain’s Kyle Edmund suffered a 4-6 6-3 6-1 defeat to Diego Schwartzman. There were also wins for Roberto Bautista Agut, who set up a tie with 11-time winner and defending champion Rafael Nadal, qualifier Lorenzo Sonego and Spaniard Jaume Munar. Elsewhere, Dusan Lajovic, Philipp Kohlschreiber, who faces top seed Novak Djokovic next, Mikhail Kukushkin and Martin Klizan also advanced.